(Houston, Texas - February 18, 2012) - On Saturday, February 18, the Texas Arabian Breeders Association (TABA) held its annual meeting at Sam Houston Race Park, where the association gave out awards for 2011 Arabian racing champions in Texas. 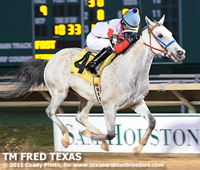 The big winner was Sam Vazquez.’s TM Fred Texas, which was named 2011 TABA Horse of the Year and Champion Four-Year-Old Colt/Gelding. TM Fred Texas is also nominated for Darley Awards as the nation’s Arabian racing Horse of the Year and Champion Four-Year-Old Colt/Gelding. TM Fred Texas won five of his six starts in 2011, including victories in the President of United Arab Emirates Cup Stakes (G1) at Churchill Downs on June 18, the Sheikh Zayed Bin Sultan Al Nahyan Arabian Cup Open Stakes (G2) at Delaware Park on July 2, and a dominant seven-length triumph in the Texas Six Shooter (G3) at Sam Houston Race Park on March 4. In addition, the son of Burning Sand took allowance races at Sam Houston and Arapahoe Park and finished second in the H.H. Sheikh Mansoor Bin Zayed Al Nahyan Arabian Cup Stakes (G3).